ACCOMMODATION - Raqs Without Borders 2019: MENA dance festival in NYC: 08/24/19-8/25/19. Registration is now open! There are plenty of excellent hotels and restaurants in the vicinity within a reasonable distance and price. Airbnb.com offers excellent rooms and apartments for rent for affordable prices as well. Set 3 blocks from Union Square, this straightforward budget hotel is housed in a historic building in lower Midtown and is 3 blocks from a subway station. Simple, but traditional rooms have WiFi (surcharge), TVs with basic cable and private or shared bathrooms. The hotel has a 24-hour front desk and is within a block of several restaurants and coffee shops. 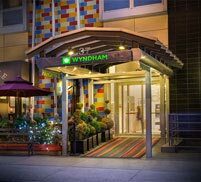 Situated in the trendy Chelsea district, this modern hotel is a 4-minute walk from the 23rd Street subway station and a 7-minute walk from Madison Square park. 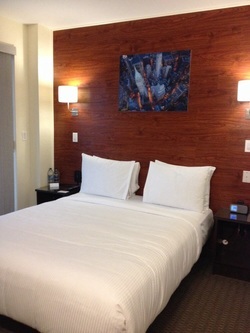 Chic rooms include free WiFi and flat-screen TVs with HD channels, plus custom-designed beds, desks and coffeemakers. There's free on-site hot breakfast (daily) and weekday breakfast bags to go, as well as a fitness center and a small convenience store. Additional amenities include a 24/7 business center and coin laundry. Price range: $146-$270 a night. A 4-minute walk from Madison Square Park, this modern hotel is also a 12-minute walk from both the Empire State Building and Madison Square Garden. Unpretentious rooms offer flat-screen TVs, free WiFi, desks and coffeemakers. Upgraded rooms and suites add balconies. There's a laid-back Italian restaurant with indoor and outdoor seating. Other amenities include a lounge/bar and an exercise room. Price range: $101-$125 a night. Budget guesthouse boasts simple, low-key accommodations, some with shared bathrooms. Price range: $145-$200 a night. This stylish boutique hotel in a 6-floor building on the Lower East Side is across the street from the subway and within 3 blocks of famed neighborhood eateries such as Katz’s Delicatessen and Russ & Daughters. The modern rooms feature wood floors, marble or glass bathroom tiles, premium bathroom products and ornate wallpaper, as well as flat-screen TVs, iPod docking stations, and complimentary WiFi & bottled water. A private rooftop terrace is available for guest use. Price range: $220-$340 a night. A 6-minute walk from the Flatiron Building, this boutique hotel with art nouveau-inspired rooms is a 4-minute walk from the 6, N, and R subway lines. The Empire State Building is 5 blocks away. Elegant, upscale rooms offer complimentary WiFi, flat-screen TVs, iHome clock radios and minifridges, plus luxurious touches such as Italian bed linens, designer toiletries and walk-in showers with rainfall showerheads. Suites add whirlpool tubs and living rooms with pull-out sofas. Complimentary coffee, tea and pastries are served daily in the lobby. A business center and valet parking are available (fee). A trendy lounge next door has all-day dining. Price range: $164-$449 a night. This hip hotel in the NoMad neighborhood is 4 minutes' walk from 28th Street subway station and a 5-minute walk from Madison Square Park. Urban-chic rooms come with work desks, designer toiletries, 40-inch flat-screen TVs and free WiFi. Minifridges are available on request. Upgraded quarters add separate sitting areas and/or balconies. Freebies include continental breakfast and coffee. Price range: $190-$220 a night. Run by a Catholic charity, this simple guesthouse serves travelers of all faiths, for stays of up to 14 days. The location is 1 block from a subway, 2 blocks from the High Line urban park, 3 from Chelsea Waterside Park (bike path) and 4 from Madison Square Park dining. It is 9 blocks south of Penn Station trains. With modest traditional furnishings, single or double rooms (all non-smoking) have cable TV; some have private bathrooms, other have sink and toilet and share showers. Family rooms sleep up to 4. There are various WiFi hotspots throughout the house. A breakfast buffet is served, and guests have access to a garden and a chapel. Price range: $313-$1200 a night. Set in a 1911 beaux arts-style building, this chic hotel overlooks Union Square Park and is 7 minutes' walk from Gramercy Theatre. Contemporary rooms and suites feature flat-screen TVs, iPod docks and WiFi (surcharge). Upgraded rooms have park or city views. Some suites add whirlpool tubs. In-room spa treatments are available. There's a swanky restaurant that serves Mediterranean food. Other amenities include a fitness center and more than 7,000 sq ft of meeting space.